Three weeks ago, my daughter Heather’s eye-witness account of surviving hurricane Irma on St Thomas was published. She and her family were evacuated by catamaran to Puerto Rico. These small boats delivered emergency supplies, and rescued a thousand people in a few days from the US Virgin Islands. My daughter and her partner Peter have lived on Puerto Rico and St Thomas for twenty years. Peter’s family is Puerto Rican and Heather moved there with her mother as a teenager. But a few days after they arrived in Luquillo on the northeast shore of Puerto Rico, the next storm Maria strengthened to another category 5 hurricane, destroying more islands in its path and targeting Puerto Rico directly. Day after day, I followed the hurricane track forecast, which remained straight across the island from southeast to northwest. Now I had the impossible task of weighing the risks of 140 mph winds, a 6 ft storm surge (their apartment was on the coast) and severe flash flooding (20 inches of rain fell on the mountains). Traumatized by Irma, they looked at the situation, spoke to relatives on the island and borrowed a car. They drove to safety on the far southwest coast the day before Maria hit. Having survived Irma, they stocked up on food and water. Realizing that the island would lose power, water and communications, they took $500 from our joint bank account, because they had seen after Irma that everything collapsed to a cash economy. 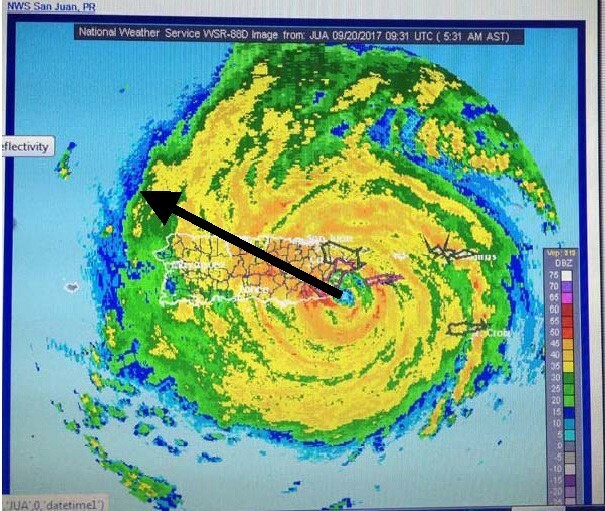 As Maria approached, I was once again watching the Puerto Rican weather radar: this time the radar was destroyed the moment the storm hit the southeast coast around sunrise. The devastation was staggering. Puerto Rico lost all power and communications: and most of the island is still without them. It was 6 days before I had got a static-garbled message: just enough to tell me they were alive. The storm stripped leaves from a 50-mile swath across the island, and destroyed 95% of the agriculture. The roads were blocked by debris and fallen trees. Most of the hospitals were damaged. They had chosen a good place. The small hotel, that gave them a room even though it was closed, also had backup power that ran at night. This preserved their cooked food - and their candles! After a week as the roads were cleared and their food was running low, they set off. Heather later told me that without leaves, it was like driving through a brown desert. Imagine for a moment setting off to make a post-apocalyptic journey across a flattened island in ruins. They needed a miracle. First they found a small shop open that had been miraculously restocked, and were able to buy food and water: critical as their water was almost gone. They needed gas, and someone sold them enough to get back to Luquillo (for $100). In the more populated areas of the island there were 5-hour lines to buy 2 gallons of gas at the few stations that had some. Then they saw a cell tower on the road that was working, and they stopped and called me. It was our first phone conversation 7 days after the storm. I could hear Heather’s gratitude to make contact, and her joy of being able to meet the basic needs of life for her family for a few more days. They got back to Luquillo, which still does not have power and cell service. But two new miracles: they have potable water, and they found their rental apartment has a barbeque grill with a full tank of propane. They will soon be able to cook. Their food is running low and they are sharing some with neighbors who have none. But stores are reopening and in a day or two they may be able to buy food, as they still have a little cash left. At the moment, the big stores are only letting in a few people at a time, so the lines are impossibly long. She believes this is to prevent theft – but many have no cash and are starving. This is life for the three million US citizens on Puerto Rico, in a new deep survival sharing mode, as our government drifts. Today my daughter says she saw Trump drive past, thirteen days after Maria hit. Perhaps his generals can explain how bad the situation on the ground really is? The first week of October, Central and Southern Vermont Hurricane Relief in partnership with JetBlue and CapeAir transported 3750 lbs of supplies from Rutland airport through Boston to Puerto Rico; as well as on to the US Virgin islands. If air service improves enough, JetBlue will evacuate my daughter’s family to Vermont on Oct 18. Hurricane Maria as it hits Puerto Rico at 5:30 am on September 20, heading west-north-west (National Weather Service radar).